A variety of Hilltop mastheads used over the years. Top to bottom: June 18, 1927; March 18, 1948; August 29, 1975; October 1, 1976; May 1, 1992. Left: February 2, 1995. 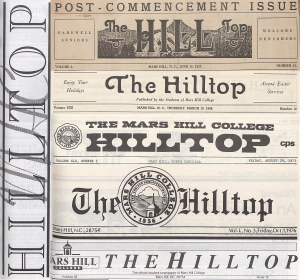 Seventy years of The Hilltop, Mars Hill University’s student newspaper, have been added to DigitalNC. 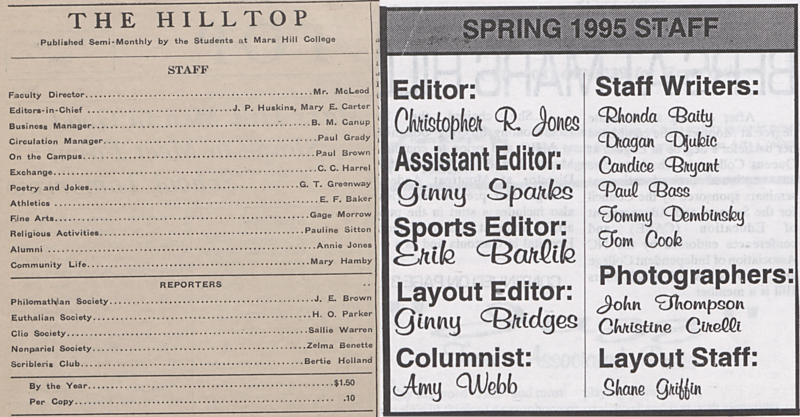 The 924 issues were provided by our partner, Mars Hill University, and cover academic years from 1926-1995. 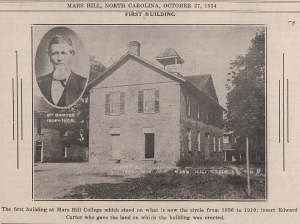 Image of the first building at Mars Hill College taken from the October 27, 1934 issue of The Hilltop. 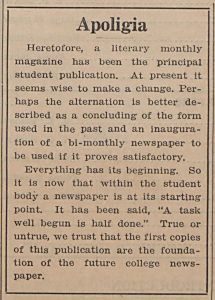 An article introducing the new Mars Hill College newspaper from the first issue dated September 25, 1926. First founded as the French Broad Baptist Institute, the name was not long after changed to Mars Hill College. In 2013, it became Mars Hill University to reflect the institution’s growth in enrollment and the variety of educational offerings. 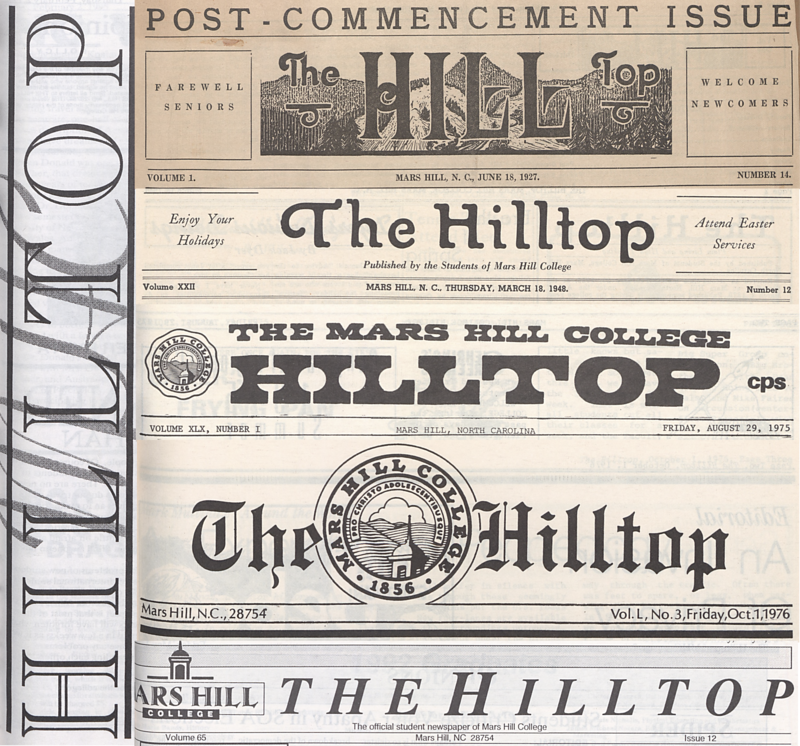 Students began publishing The Hilltop when the institution was still Mars Hill College. It is the official student newspaper created to cover campus news for the students, faculty, and staff. Articles cover a wide variety of topics. 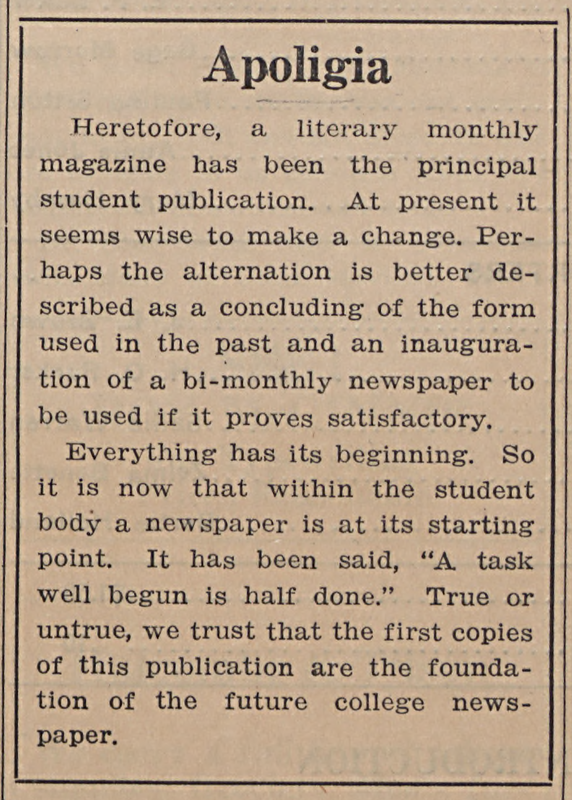 The first issue from 1926 reports on campus beautification efforts, student enrollment, activities of campus organizations, the upcoming football season, and more. Faculty and staff news is also covered, with reports on new hires, retirements, and milestone events. To read these and thousands of other articles, visit and browse the Mars Hill University Student Newspaper page. 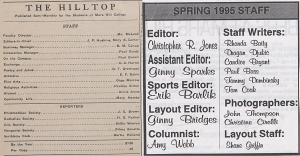 List of staff members for The Hilltop from the September 25, 1926 issue (left) and March 30, 1995 issue (right) who worked to bring news to the campus community. The Mars Hill University yearbook, The Laurel, is also available on DigitalNC with editions from 1917-2016. For more information about these and other materials from Mars Hill University, check out their partner page or their official website.